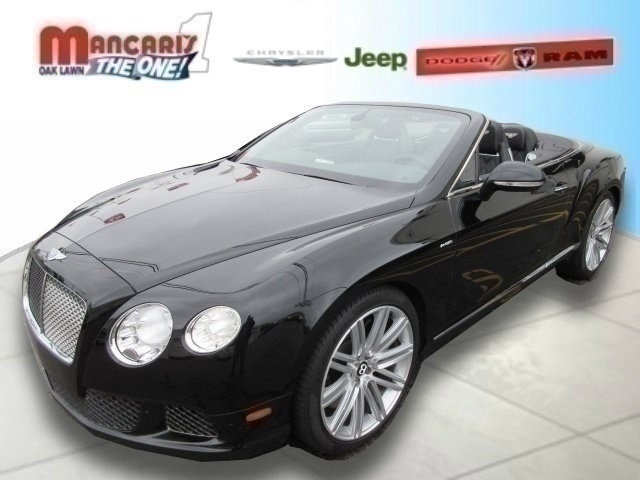 Pre-Owned 2014 Bentley Continental GTC Speed 2D Convertible in Oak Lawn #4-581P-4 | Mancari's Chrysler Dodge Jeep RAM, Inc.
OR BEST OFFER* 6 LITER 12 Cylinder engine * * GREAT DEAL AT $149,990 * * 2014 ** Bentley * * Continental GT Speed * * Base * The backup sensor, rear air conditioning, push button start, remote starter, parking assistance, a navigation system, braking assist, dual climate control, hill start assist, and traction control of this 2014 Bentley Continental GT Speed Base make this vehicle a true standout. For a good-looking vehicle from the inside out, this car features a ravishing royal ebony metallic exterior along with a burnt oak interior. Don t regret waiting on this one! Call today to schedule your test drive. Please Keep in mind... Nationwide shipping available, Just ask! We accept all offers and approve most, Mancari's of Oak Lawn guarantees the best prices in the Midwest! Appointments are highly recommended, Call us today @ 708-423-1700. Please keep in mind our inventory changes daily. Tax, title, license and doc fees extra.